Spain's Prime Minister Mariano Rajoy may take a pounding from fresh corruption allegations against his centre-right People's Party but the government is strong enough to ride the storm, analysts and sources say. A Spanish newspaper said yesterday (9 July) it had handed over handwritten documents to the High Court which it said were ledger entries showing payments from an illicit slush fund run by the PP to party leaders, including Rajoy. El Mundo newspaper splashed color photocopies of the ledger entries on the front page of Tuesday's paper, the latest installment in a long-running corruption scandal which has damaged the government's credibility as it seeks to bring a sickly economy back to health. "It obviously doesn't help the Spanish brand," Foreign Affairs Minister José Manuel Garcia-Margallo said on Tuesday when asked about the latest twist in the scandal. Spain's ruling PP party and the government repeated denials that party members had ever received illegal cash. But the scandal has refused to go away since El País newspaper published photocopied excerpts of the same ledger in January. It has angered Spaniards suffering a long-running recession, high unemployment and public spending cuts. El Mundo did not say how it had got its hands on the documents, but the editor, Pedro Ramirez, published on Sunday an interview with the alleged author of the ledger entries and operator of the slush fund – former PP treasurer Luis Bárcenas, currently in custody as the High Court continues a pre-trial investigation into corruption charges against him. The newspaper said payments amounting to tens of thousands of euros were delivered to party leaders, in Rajoy's case sometimes concealed in a box of cigars. The affair has not affected the premium investors demand to hold Spanish debt rather than the German benchmark, a measure of perceived political risk. But top government officials acknowledge that the corruption allegations are damaging the country's image abroad. Senior PP members, speaking on condition of anonymity, also concede that many within the party fear they will lose European elections in 2014 and local and general elections in 2015. They would like to see Rajoy, known for his caution, fight back more strongly against the allegations. 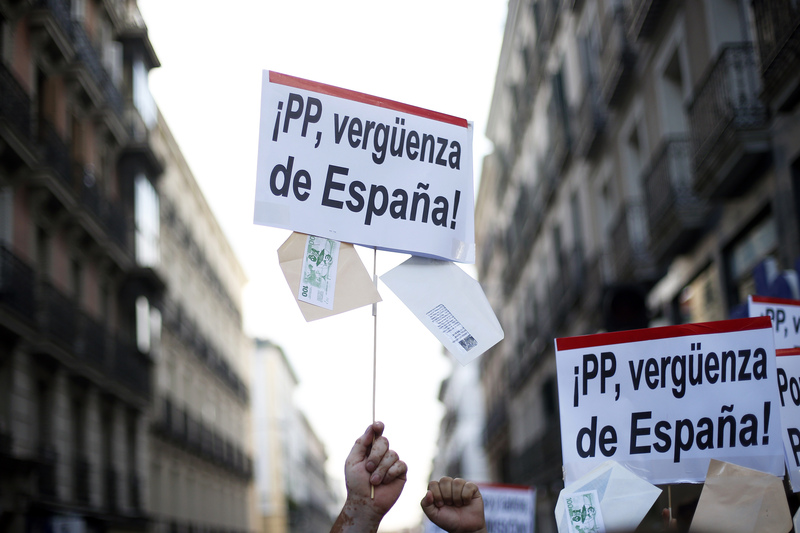 Support for the PP has crumbled to 23% from 45% at the time of the November 2011 general election, a poll published on Sunday in El País showed. While conceding in private that the first corruption allegations in January slowed down the pace of government reforms, PP officials insist Rajoy's leadership is not seriously questioned within the party. The government also retains a strong parliamentary majority which it has used on several occasions to block other parties' demands for explanations on the Bárcenas case. The opposition Socialist party has failed to capitalize on the PP's falling popularity, as it fights its own corruption scandal in the Socialist-controlled region of Andalusia. Just 21.6% of those surveyed in the El País poll said they would vote for the opposition party. While the Bárcenas scandal is commonly cited in banners at street protests, the numbers demonstrating are smaller than they were at the birth of the 'indignados' youth movement in May 2011. "This is the latest of many factors to erode the image of the government in the eyes of the public," said Juan Carlos Rodriguez, analyst at political consultancy Analistas Socio-Politicos. "I don't think it will harm their electoral prospects much, because they are so low it's almost impossible for them to fall further," he added. "The government has a more than sufficient majority to withstand this." Rajoy and his government can also count on the tortuous procedures of the Spanish court system to resist pressure to step down, knowing that cases often take many years to reach trial, let alone a verdict. The first Bárcenas case involves a group of businessmen suspected of putting on campaign rallies for the PP in exchange for kickbacks. The second centers on the slush fund reported to have taken donations from companies in return for contracts in regions governed by the PP, and – according to the allegations which the party and government deny – to have distributed part of them to party leaders in cash. Bárcenas, who had previously denied the handwriting in the ledger was his, said in Sunday's El Mundo interview that he had lied and it was indeed his script. He said the photocopies published by El País were a fraction of the documents he had that detailed illegal financing of the party. The public prosecutor's office said on Monday it would recommend High Court investigating Judge Pablo Ruz call Bárcenas to testify again. He is charged with money laundering, bribery, tax fraud and other crimes. Prime Minister Mariano Rajoy and Spain's ruling People's Party are under pressure since January over revelations that the party passed payments from business donors secretly to the premier and other party leaders. El País published images of excerpts of almost two decades of handwritten accounts that it said were maintained by People's Party treasurers. El País said the accounts showed 11 years of payments to Rajoy of €25,200. The accounts - which the newspaper said amounted to a parallel unofficial bookkeeping system - indicate donations from companies, mostly builders, and regular payments of thousands of euros to a number of party leaders. The report is the latest twist in a scandal over alleged secret cash payments to PP leaders that has hit Rajoy's popularity amid a deep recession, high unemployment and a fiscal crisis that could push Spain into an international bailout. 60% Youth jobless and ih that is truewith this pm corruption ?!! Then the EU shoud overtake that lazy governement and manage this state out the crisis & corruption with it’s 28-1 Leaders ! I’m sorry for the spanish people !